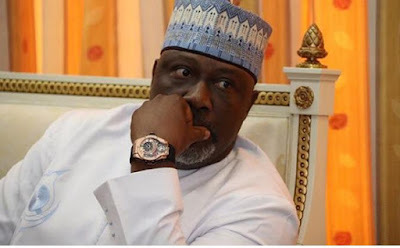 The police on Tuesday arraigned the Senator representing Kogi West, Dino Melaye, on nine counts bordering on obstruction and resistant to lawful arrest. He was arraigned alongside his domestic worker, Silas Omenka, before Justice Halilu Yussuf of the Federal Capital Territory High Court. Justice Yussuf on Friday ordered the police to release the senator after spending 15 days in detention without being charged to court. But the police quickly filed the charge against him while perfecting his bail conditions. Justice Yussuf while ruling on a fresh bail application moved by Melaye’s counsel, Mike Ozekhome (SAN), said the bail conditions set for the lawmaker last week should be maintained. Ozekhome urged the court to sustain the bail conditions as granted on Friday, which he said his client had already met but the police refused to release him. Although, lawyer for the Inspector-General of Police, Magaji Labaran, did not oppose the bail application. Ozekhome argued that Melaye had been given his passport to travel abroad and returned to the country. He also submitted that the police must have concluded investigations before arraigning his client. Melaye’s counsel further explained that the accused would stand for election on February 16 and would not jump bail. While ruling on his application for enforcement of fundamental rights on Friday, the court ordered the senator to provide three sureties, two of who must be residents of Abuja with evidence of landed property in the FCT. The third surety must be the clerk of the National Assembly who is to give an undertaking that Melaye would attend trial after being treated. Meanwhile, the police agreed to release Melaye on Tuesday after perfecting his bail conditions. A family source told our correspondent that “the Senator is home now and resting”.